Blog/Cases Gardasil side effects healed. If your child is suffering from side effects after the Gardasil vaccine, this story will bring you hope. Here is a true story of recovery- read Ellie and her mother Michelle's own words. First of all thank you for agreeing to share your journey with us all. Tell us, how did you know you were Gardasil injured and what were your symptoms? I had been ill for some time and doctors couldn’t figure out what was wrong. My mum's friend had mentioned to look into the HPV vaccine after it was mentioned in one of her support groups. After that, everything seemed to fit into place. My mum then joined a support group which then led us to finding Rita. Ellie had been ill for some time when we finally figured out the Gardasil vaccine was to blame. She had always been very healthy, and hardly ever went to the doctors. 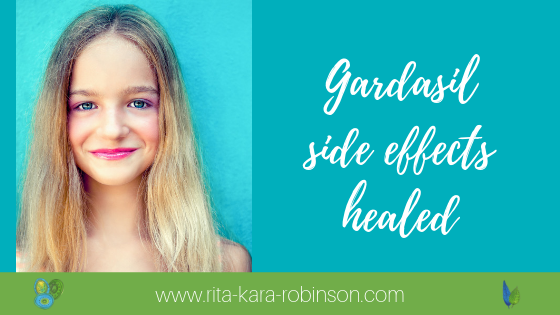 After the first dose of Gardasil she started having headaches, and was very tired all the time but we never thought it could be an adverse reaction. After the second dose she deteriorated with lots of health issues. We didn’t understand what was going on and I asked the doctor if it could be possible that the vaccine had triggered something ? He said no, and Ellie just continued to get sicker and eventually ended up bed bound. By chance my friend told me about something she had read regarding girls getting ill after the HPV vaccine so I looked into it and was horrified to learn that all these girls had the same symptoms as Ellie. I remember that day so clearly, and the guilt I felt that I had done this to my daughter by consenting to her getting this ja ! plus lots of other issues, all of which are listed as known adverse reactions to Gardasil vaccination. Had you tried any therapies before, and what was your initial thought about homeopathy before you tried it? We had tried medication prescribed by the GP and consultants at the hospital but nothing seemed to help in any way and actually made my symptoms and pain worse. By this point I was bed bound and had nothing to lose when my mum suggested homeopathy. If I'm completely honest I thought homeopathy wasn’t going to help me, I had been bed bound for so long I had lost all hope of getting better. We had tried medication off GP, painkillers, vitamins, and iron tablets but nothing helped. I knew very little about homeopathy before I started searching for help for Ellie. I had read about other girls that were having good results using homeopathy. From the moment I spoke to her I knew that if my daughter had any chance of recovery it was going to be with homeopathy, it's one leap of faith I will never regret. Can you tell us a bit about your healing story? During the first few months of detoxing I was extremely sceptical as I didn’t feel any different and I was still in pain but my family could see the slight changes in my health, then as time went on I began to notice changes myself, it was simple things at first just like me being able to get out of bed without being in pain and actually eating a meal without being in absolute agony. I began to have more energy even if it was just being awake for a couple of hours and then going back to sleep, my palpitations became less frequent and my memory and concentration improved. My numbness in limbs also got better. It was very hard in the beginning as Ellie was so ill, she had lost all hope of ever being healthy again! She had no faith in doctors or consultants left and neither did I. The very first thing Rita said to her when we had our first consultation was “ you will recover” it filled me with hope. In the first few weeks there were very small changes in Ellie that even she couldn’t see but I could, she was awake a little more, she actually had a conversation with you, her appetite was slightly better. pain and palpitations were getting less, joint pain much better, the dark sunken eyes disappeared and her colour was coming back. Little by little and then in leaps and bounds my daughter was back to her funny, beautiful cheeky self. How long did it take and what else did you do to help yourself? It took me about 2 years to recover to a point that I am now able to attend college and do the things I was once able to do. I made diet changes which included cutting out all gluten, wheat, dairy, caffeine, sugar and all processed food, I drank water high in silica and took natural supplements. As Ellie said it took 2 years to get to the point we are now at with Ellie leading a normal life, she is still healing and still has to listen to her body and rest when she needs to but has come so far. I am confident that she will make a complete recovery in time. Ellie was amazing at sticking to her very limited diet while she was detoxing and it was really hard for me to make meals that she could enjoy but we got through and its all been worth it. What do you think of homeopathy now? I think homeopathy is absolutely amazing, and I now only use homeopathy. ailments it truly is amazing ! What would you say to other Gardasil injured girls? I would tell them to not lose hope in getting better, I'm proof that getting better can happen. If I look back now to where I was a few years ago I would’ve laughed at the idea of getting better again as I had given up all hope and I had come to terms with how my life now was. What would you say to their mums? GPs tell vaccine injured that they not ill but depressed and their pain is not real! I know the pain is real and that homeopathy has given me my daughter back. Thank you both so much for sharing your story. I am sure it will resonate with many mothers and their children in the same situation. There are more stories like this in my blog and on my testimonial page. To work with me like Ellie did you can email me to go on my waiting list or jump the queue by booking with my team who will take your notes and pass them to me and I will prescribe. Please note that from now on we are no longer working with girls on contraception or steroids who wish to remain on these medicines while detoxing as it's a huge barrier to cure. I look forward to meeting some of you readers.